Reaching the lost requires removing every possible barrier of understanding – even some things you love. It’s time to let go of some of these weird practices of the church that have nothing to do with Jesus. Are your worship services evangelistically understandable? If you are not sure, they probably are not. “Thank you for making me not feel stupid.” How to be a church where people can seek God and walk back to him. Inspiring people to trade church the way we want it to become a place where God is moving is a critical job of pastoral leadership. Making it possible to follow Jesus with a few non-essential *(stylistic, personal preference-driven) barriers as possible. Talk about where God is calling you to go and don’t get tired of talking about it. Don’t get bored or give up… persistence toward God’s better future is critical. Find the common ground of a church on mission and filter needed changes through a better future that God has ahead. A unifying direction must be more than a catchphrase or neat sentence but brings a thread of accountability and direction to every part of the organization. Everybody says they want vision but what they don’t realize they mean is that they want their own vision. There is no way to satisfy every expectation only to go where God wants us to go. It’s easy in ministry to get consumed by the activity and lose track of Gods productivity in the lives of people. When there are no stories, either we are not paying attention or what we are doing is not actually working. Without purpose and meaning toward life change – church becomes a hobby and a terrible one at that. When team members are free to share good ideas and share new approaches, they are able to take greater and greater ownership. Time rarely solves the problems on their own… next steps matter more than a statement. Separate the urgent from the important. Not everything that is happing now is important and not everything that is important is happening now. When everything seems urgent, your team cannot easily discern what is actually important. Deciding when you use these essential communication tools can define a clear line between the urgent and the important. 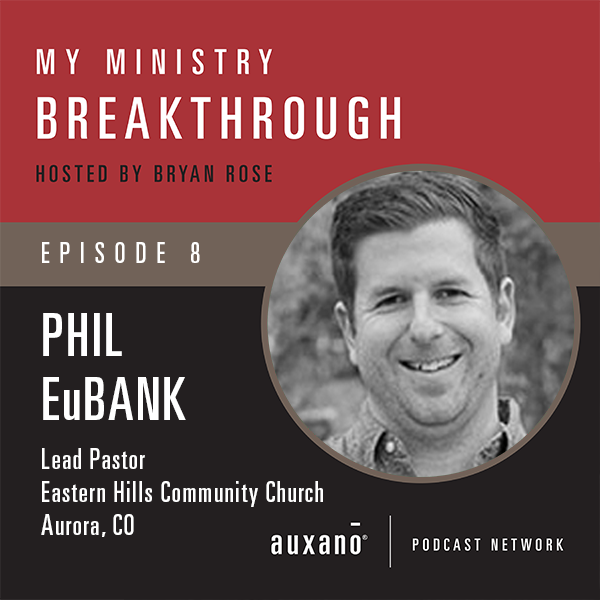 Phil EuBank moved to Colorado two and half years ago where he serves as the Lead Pastor of Eastern Hills Community Church. Phil makes sure everyone knows that He has a gorgeous and brilliant wife and 3 really cute kids. He loves seeing people who have given up on God or church unnecessarily coming to a life-changing relationship with Jesus. How can a church reach Christians who live in the city, from within the city, not just the suburbs? True fulfillment as a Christ-following leader comes from a deep sense of two key understandings. Why it is important to bring yourself back to your calling as a leader, not someone else’s. It is hard to truly rest if people are constantly in contact, and what to do about it. Every leader needs to know their symptoms of exhaustion and unkempt health. The importance of every small group having direct contact with this person. Marry Biblical Gospel rooted purpose with a vocational dream and people are not just looking for a job after school, they are being sent into a calling. The big problem of never really casting vision beyond week-to-week ministry engagement. How does the horizon storyline work and why is it important? Learn the art of “purposed nothingness” and how this makes room for the Holy Spirit. The one big idea to having a church of deep maturing disciples who are loving caring people reaching the lost. Three things that, together, are the source of life and effectiveness in ministry. 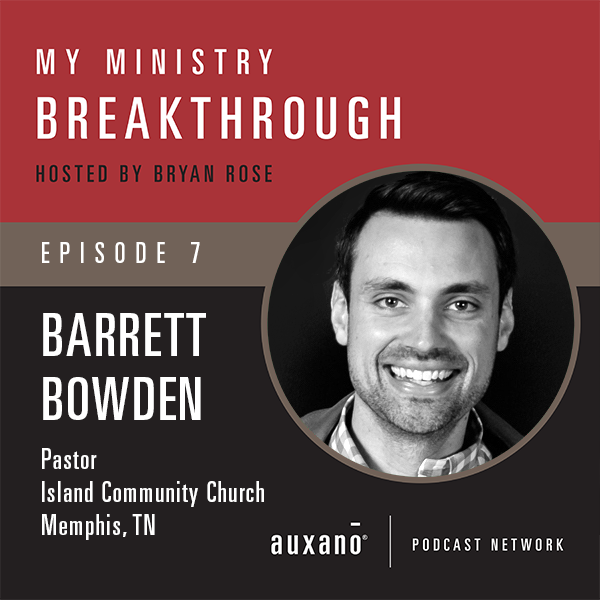 Barrett Bowden is the pastor of Island Community Church, a young and thriving congregation in downtown Memphis. Barrett has a heart for leading the church to invest in its unique, urban context and to cultivate missional leaders with a heart for the nations. Barrett is married to Michelle, an adolescent pediatrician in the Memphis area, and they have one adorable daughter, Caroline Jane.